Many amateur bakers are intimidated by caramel, but this recipe is very simple; it just requires paying close attention to the butter, brown sugar, and milk, and exhibiting some patience in waiting for the caramel mixture to cool slightly before the incorporation of the powdered sugar. It is an excellent choice for chocolate cake, but also pairs nicely with white cake or almond cake. This recipe yields enough for 24 cupcakes or one bundt cake; I have not tried to frost two-layer or sheet cakes with it yet. Combine butter and brown sugar in a medium saucepan and slowly bring to a boil. Boil for one minute, remove from heat, and stir in milk. Return to heat and bring to a boil once again. Pour mixture into mixing bowl and allow to cool slightly, about 5 minutes. Beat caramel mixture on medium speed for a few minutes to disperse heat; the mixing bowl should not be too hot for you to touch, but if it remains warm that is fine. Add one cup powdered sugar and one teaspoon vanilla, beating until smooth. Slowly add the remaining powdered sugar and vanilla, beating until smooth. Frost cake or cupcakes quickly, as this will set very quickly. Love me some caramel. And it is surprising easy. So is dulce de leche, actually. These cupcakes look delish. thanks! 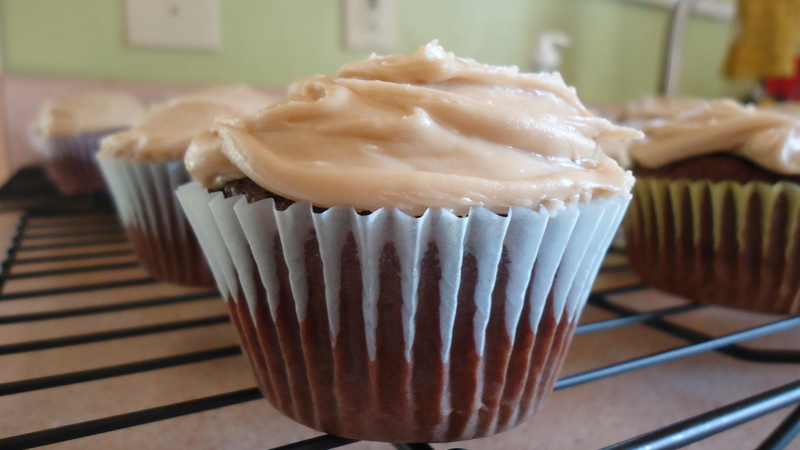 these cupcakes are really easy and i love chocolate/caramel combos! do you have a good recipe for dulce de leche? i’ve only seen ones that literally take hours! Someone has been busy with frostings! These all look so good. I have made regular caramel before, so I won’t be intimated by this frosting. What do you think about those Duncan HInes Frosting Creations?? Homemade will always win in my book. i have to admit…i just decided to post all of these when i updated my “frostings” page! but they are all quite good–i think the caramel is my favorite. i haven’t tried those duncan hines frosting creations ones but i keep seeing them in the baking aisle at the supermarket…i suspect they’d do in a pinch, but i, too, prefer homemade frosting. especially since it’s usually not that hard to make!